Welcome to the Mascoma Chapter Home Page! All Chapter field trips/walks and programs are free and open to the public. The male, American woodcock’s mating flight is one of the avian world’s great spectacles, an upward spiral followed by a plunging dive back to earth. This outing will seek to observe that memorable display. Due to the uncertainty of weather and ground conditions at this time of year, the exact date and place of the walk will not be known until early April. Visit our website www.mascomabirds.org for updates. Walking conditions are through fields over uneven, unpaved surfaces that may be damp. Appropriate footwear is highly recommended. The event is free and open to the public. Bring binoculars and/or a spotting scope as you prefer. All experience levels welcome. To be led by Mascoma Chapter Steering Committee member George Clark. Co-sponsored with the Kendal Birding Club. The Mascoma Chapter’s annual outing along the Connecticut River’s New Hampshire side is to take place Saturday, April 27. We'll be looking for migrating waterfowl and early-returning songbirds. The trip will start with a visit to Hanover’s Wilson’s Landing before heading north on River Road making stops at Hewes Brook, the Wilder WMA and other locales before concluding Lyme’s Grant Brook. Meet in the Sheridan Printing parking lot on NH Rt. 10 next to Hanover’s Richmond School to form carpools. The walk is free and open to the public. All experience levels are welcome.﻿ Walking conditions are level and over mostly paved surfaces. Bring binoculars and/or a spotting scope as you prefer. To be led by Mascoma Chapter Steering Committee member George Clark with assistance from co-sponsors Gail McPeek of The Hanover Conservancy and Kaytee Currie-Huggard of the Upper Valley Land Trust. This visit to the former site of the Bedell Covered Bridge, lost in a September 1979 hurricane, offers an opportunity to see a wide variety of birds due to the park’s interesting combination of riparian, mixed woodlands and agricultural land habitats. The park entrance is located on NH Rt.10 just north of the Haverhill Green. Meet in Dartmouth’s new Lewiston parking lot adjacent to the Norwich end of the Ledyard Bridge to form car pools. Walking conditions are level but will be damp if there has been recent rain. The event is free and open to the public. To be led by Mascoma Chapter Steering Committee members Jeff MacQueen and George Clark. For the third consecutive year, Mascoma Chapter Steering Committee member Jeff MacQueen will lead a bird walk along the Mascoma River. This year we will explore the newly opened (July 21, 2018) Mascoma River Greenway Trail (MRG). This paved, segment offers lovely views of the Mascoma River along its course beginning just east of Alice Peck Day Hospital (APD) then traveling westerly to its current terminus near Glen Road and the Miracle Mile. Expect to see a good variety of songbirds and perhaps some waterfowl. Meet at the access point parking area opposite APD on Mascoma Street. From any starting point, head to I-89 Exit 17. Coming from the west, turn right at the bottom of the ramp and head towards Lebanon on Mechanic Street. From the east, turn left at the bottom of the Exit 17 ramp and also head toward Lebanon on Mechanic Street. After about a ½ mile, you’ll see a left hand turn that passes through the old granite underpass. On the other side, turn right onto Mascoma Street. The parking area will be on your right a few hundred feet farther along. Foot travel will be on a level, paved surface. Bring binoculars and/or a spotting scope as you prefer. Bug repellant, particularly with tick prevention in mind, is highly recommended. The walk is co-sponsored by the Mascoma Chapter of NH Audubon and the Mascoma River Local Advisory Committee. Join our popular, early morning, May series of weekly searches for warblers and other returning spring migrants at Lebanon’s secluded gem, Boston Lot Lake. Meet in the more northerly of the two parking lots on NH Rt. 10 directly across from Wilder Dam. Walking conditions include a fairly steep, uphill climb and surfaces that are unpaved and uneven. If rain has occurred recently ground conditions could be muddy or damp. Sturdy footwear is recommended. To be led by Mascoma Chapter Steering Committee Chair Blake Allison. “Feathered Fridays” will be returning to the Mink Brook trails again this May. If last year’s walks are any indication, we should expect to see a good variety of migrating passerines as well waterfowl thanks to the varied habitat through which the trail system passes. Meet in the parking area adjacent to the electrical substation on NH Route 10 about ¼ mile south of the Hanover business district. The trails are level but mostly dirt surface, which means they could be muddy should rain have occurred near the day of the walk. To be led by members of the Mascoma Chapter Steering Committee. Saturday morning, under cloudy skies, the Mascoma Chapter of NH Audubon hosted its first bird watching event of the 2019 season. Fourteen birders were in attendance under cloudy skies with the temperature hovering in the mid-30s. The chapter chooses the Wilder Dam site, because there is a bald eagle nest nearby, and the dam's outflow creates open water down stream attractive to bald eagles. Only one bald eagle was recorded Saturday and that was by an early arriving (9:30 a.m.) Blake Allison who observed an adult circling over the little island about 100 yards downstream from the dam. It was seen there for about five minutes before disappearing into a small stand of white pines on the river's New Hampshire shore. It did not appear during the scheduled 10:00 a.m. to 12:00 p.m. observation period. Other activity was limited to a dozen of the dam's resident rock doves, two blue jays, a common raven and nine American crows. 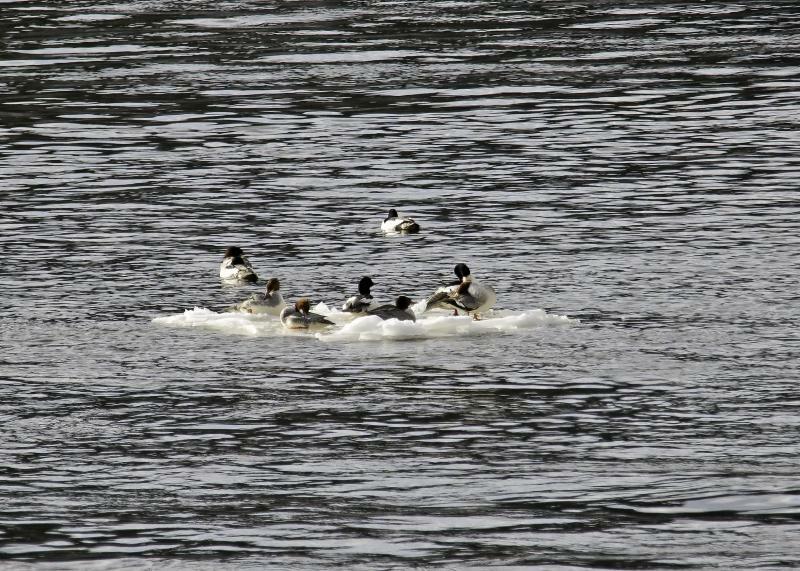 Four adult, common mergansers (two females and two male) flew in around 11:00 a.m. to fish in the open water about 50 yards below the dam. Copyright 2018 Mascoma Chapter of NH Audubon. All rights reserved.